In the battle between the Amazon Kindle Fire and the Barnes & Noble Nook Tablet, the Fire has a slight edge over the Nook, with about 39.5 percent of PCMag readers saying they have bought or will buy Amazon's $199 tablet. Of the 8,808 readers who answered yesterday's poll (below), about 29 percent selected the Nook Tablet, while 39.5 percent went with the Kindle Fire. In the comments, most buyers felt it came down to storage; if you need to access your content on the go or when you're not connected to the Web, go for the Nook Tablet. If you like Amazon's services and can connect to take advantage of the Silk browser, Amazon Prime, and more, the Fire is a good choice. "Kindle Fire is mostly for people who doesn't go out too much with the tablet or always goes to a place with Wi-Fi. Nook Tablet it's for outsiders and people who is always on the move (also for people who loves hacking it with the latest Android releases)," wrote one reader. "I like the Amazon AppStore, but that doesn't make the Fire worth it," wrote another. One longtime Prime member who was on her second Kindle, however, said she had "sold family and friends on it and have already ordered my Fire, can't wait to get it!!!" Not everyone is on the Nook or Fire bandwagon. About 12.5 percent, or 1,106 people, said they prefer the iPad, regardless of the price difference. About 4 percent were going the other way, opting for the $79 Kindle or $99 Nook. Another 11 percent, meanwhile, were still holding out for something more compelling, like the Asus Transformer Prime. Eight people wrote in the HP TouchPad, but they'll likely be waiting awhile. 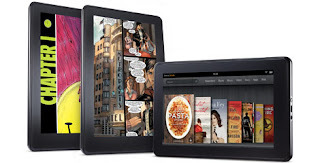 The results come as Amazon today announced that the Kindle Fire newsstand will have more than 400 full-color newspapers. Those who subscribe before March 1 will get three free months to 17 Conde Nast magazines like Vanity Fair, GQ, Wired and Glamour. The Nook Tablet debuts on Nov. 17 and the Kindle Fire is coming Nov. 15. For more, see Amazon Kindle Fire vs. B&N Nook Tablet vs. Nook Color: Spec Showdown, as well as PCMag's Kindle Fire review and hands-on look at the Nook Tablet.